It’s never too early to begin planning for the holidays. As the season approaches, why not take a few easy measures to make sure things go off without a hitch? The less stressed you are before, during, and after the holidays, the more you will be able to enjoy this special time of the year with family and friends. Brandon Moving & Storage of Central Arkansas has a few smart suggestions for organizing and stowing your holiday decorations at the end of the season. If you are getting ready to move to a new home, these tips will be especially helpful by showing you ways to safely store your decorations and other fragile items for transport. First, think about donating unneeded items. As the season of cheer approaches, it’s a good idea to take an inventory of your holiday decorations and other items you might be pulling out of storage. Don’t be afraid to let go of older decorations that are deteriorating, or decorations you don’t have a spot for. Goodwill and the Salvation Army are great organizations that will accept these items and get them to those who are in need. You can even get receipts for your donations and list them for tax credits! Save wrapping paper to use for packing material. After your family opens a bunch of presents, why not save some of the torn wrapping paper to use as padding for decorations? You can shred the paper into smaller strips and tuck them around your breakable decorations as you place them in boxes. This method is especially good for Christmas lights, ornaments, and other decorations that might break during transit. Save egg cartons and cardboard shipping boxes. Empty egg cartons are great for storing smaller fragile items such as Christmas ornaments. Shredded paper or other packing material can also be stuffed in around your ornaments to provide extra cushion. You don’t need to hang on to every shipping box from Amazon.com or wherever you shop (these can be recycled), but it’s good to keep some smaller cardboard boxes around to safely store fragile decorations. Label everything! Use your boxes and egg cartons to organize your decorations by room (or by item type, if that’s easier to pack). It’s helpful to label boxes that contain decorations for a specific room—you’ll thank yourself when the time comes to bring them down next year for decoration, or when you are unpacking everything at your new home. Whether you’re about to move or not, holding a garage sale is a good way to get rid of unneeded stuff and make some cash in the process. However, garage sales and yard sales can involve a lot of hard work and stress. Brandon Moving & Storage of Central Arkansas has some tips on how to get your garage sale going while keeping your peace of mind! If you are moving soon, whether you’re going to be renting an apartment or closing on a new house, you can save yourself some time, money, and heartache by choosing the right time to move. Let’s face it: moving is tough. It’s even tougher when you’ve got extra family members that need special attention while you’re trying to organize rooms, pack boxes and plan the moving schedule. However, kids have a way of making mundane activities fun if you get them in the right mindset! Brandon Moving & Storage of Greater Central Arkansas has some ways that you can make the whole moving process a family affair - and one to fondly remember. Whether you’re moving as an individual or you’re moving as a family, the number of personal belongings can often multiply without notice. If you’ve lived somewhere for a long period of time, this is especially true. Brandon Moving & Storage of Central Arkansas has some tips and tricks for preparing to make the move into a smaller space much easier. Sometimes our circumstances change and finding a long-term storage option becomes a priority. Whatever your reasons are, there are some important things to consider if you’re thinking about storing your belongings for several months or even longer. With years in the business under our belts, Brandon Moving & Storage of Central Arkansas suggests a few factors to consider as you start planning to move your items into storage. We know there are many more items that require special attention when moving and we’re here to help with those larger appliances, aquariums and special artwork you’re excited about hanging. When you’ve got questions, we’ve got answers. Give Brandon Moving & Storage a call and we can talk about the belongings that require extra help! There’s a lot that goes into moving into a new home. However, moving doesn’t have to feel overwhelming. Like most tasks in life, having a plan will help you succeed. Here are a few simple steps to help plan for your next move. Step 1: Think about the logistics. Visualizing how the move will go, and where your items should go, will make your move less stressful. Make an appointment with your moving company and go over the details of moving day with your moving professionals. You can also make a simple floor plan of your new home to help visualize where furniture and other items should go when they are unloaded, and how to make the best use of space. Step 2: Get rid of the clutter (so it doesn’t follow you to the new home). Reducing the amount of stuff you have to move will make the process more manageable. Since you’ll be going through your things anyway, use the move as an opportunity to go room-by-room and clear out unused items. Try starting in the kitchen, where you can throw away older items that have been crammed in the backs of the drawers and cabinets. Older clothing and toys, etc. can be donated. You may even find some items around the house you can sell, if you have the time to do so before your move (online or garage sale). No matter how you do it, you’ll thank yourself for setting aside time to clear out what you don’t need before your move. Step 4: Organize and pack. It’s extremely important to stay organized when you begin packing. Don’t just throw stuff in boxes—plan what items can be safely packed together to save space. Items that you don’t use often can be packed first, and when moving day gets closer, you can begin packing the items you use every day. For instance, you might want to save essential items such as bedding, shower curtains, soap, and a few dishes and silverware for last so they are easier to access when you arrive at your new home. Finally, don’t forget to label each box clearly so you won’t waste time guessing what to unpack first! Whether you’re moving your family to a new home or moving your business to a new office, you need to hire a moving company you can trust. For moving your business, there is no better choice than Brandon. What do you love most about your area? "The growth that Little Rock has had over the last few years -- it has all the amenities of a big town with the small town feel." Why is your area a great place to raise a family? "Arkansas has so much access to beautiful vacation spots -- there's something for everyone." What is your favorite restaurant in the area? What is your favorite pastime in the area? "Cultivating relationships with people I wouldn't have otherwise met." What's your biggest professional challenge? "I want to please everyone." If you had to pick one, what tip would you give to someone shopping for a new home? "It is a fun process, but also a hard process. Don't get discouraged -- it's a big commitment. But it's worth it in the end." Autumn is a beautiful time in Arkansas. Thankfully, the Natural State offers many, many excellent places to view breathtaking landscapes covered in fall colors. Whether you're moving, traveling, or just ready for that Fall feeling, we'll point you to a few of the best spots in Arkansas to see the stunning leaves of Fall! The Ozark Mountains. Arkansas’ Northwest region is characterized by its wooded mountains. The Ozark Region, extending into Missouri, Kansas, and Oklahoma, is made up of three different mountain regions. In northwest Arkansas, you can enjoy a ride on the “Pig Trail” through the Boston Mountains that will give you some amazing views. The foliage in the Boston Mountains region is plush, creating a brilliant spectrum of colors in the Fall. The Pig Trail runs up Highway 23 through the Ozark Highlands, and features steep, winding mountain turns. There is also a beautiful Scenic Route nearby, running through U.S. Hwy. 71 and Interstate 49, which features many locations to stop and take in a scenic bird’s-eye view. Crowley’s Ridge. In the northeast corner of the state, you can discover another scenic drive opportunity. Crowley’s Ridge National Scenic Byway begins in St. Francis and winds south along the Ridge, ending in Helena. A trip down the Byway will provide excellent scenes of Autumn on the endless rolling hills. This area sits above the Mississippi alluvial plain and boasts some of the richest soil in the State, supporting flourishing foliage. Though it part of the Delta Region, Crowley’s Ridge is technically within the Ozark-St. Francis National Forest. Mount Magazine. 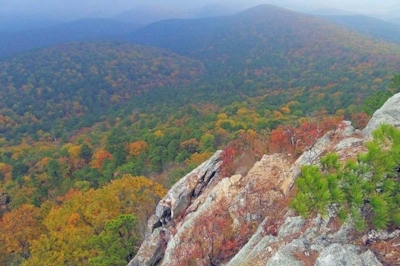 This Mountain is actually Arkansas’ tallest at 2,753 feet! Mount Magazine State Park is a great place to do some Fall leaf-viewing because there is so much to do. You can find epic views of the region’s trees from the top of the mountain, or you can take the Scenic Byway from the Lodge down state highway 309. 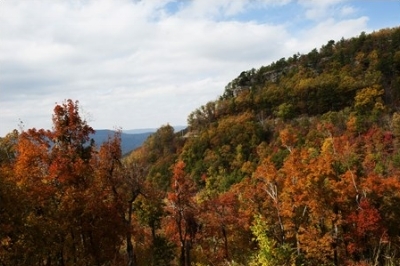 The mountain and park provide a swath of nature trails and overlooks, not to mention the camping areas and cabins—all excellent places to enjoy Arkansas’ natural beauty in the Fall. Ouachita National Forest. Visible from the peak of Mount Magazine, the Ouachita National Forest is “the oldest National Forest in the Southern United State.” The Ouachita Mountains are covered by endless woodland featuring several different varieties of Oak trees. The Talimena Scenic Byway on Arkansas Hwy. 1 is an excellent choice for discovering the natural beauty of this region during Fall. This scenic drive extends 54 miles between Mena, Arkansas and Talihina, Oklahoma, taking you over Rich Mountain and Winding Stair Mountain. Moving to a new home isn't easy. No matter how you approach it, the task will likely seem daunting because there is so much to take care of. Here are six ways to make your move that much simpler—by organizing and packing your clothes the smart way! All of us here at Brandon Moving & Storage are honored to have been named June Mover of the Month by Move For Hunger! Supporting the community and helping our friends and neighbors is important to us, and our partnership with Move For Hunger helps us give back on an extraordinary level. "CONGRATS Brandon Moving & Storage Team! You are Move For Hunger's Mover of the Month for June 2017! Thank you for all you have done to fight hunger in your community." Move For Hunger is a 501(c)3 non-profit organization working with relocation companies to collect non-perishable food items, and deliver it to food banks all across North America. Currently, they are working with over 700 relocation companies across 50 states and Canada. Move For Hunger has delivered over 8,000,000 pounds of food to food banks across North America. Nearly 570,000 people in Arkansas are food insecure, and Brandon Moving & Storage, partnered with Move For Hunger, is dedicated to helping combat the hunger in our state and nation. Moving to a new home? It’s the perfect time to declutter your life! Decluttering is a great way to get a fresh start. Here are some ways to get rid of clutter and unwanted items while supporting your local non-profit organizations and thrift stores by donating extra items.